Hillary and I had decided up on a Grace Kelly-inspired gown with a tea length full, pleated skirt, a lace jacket that wrapped at the front and created a high V neckline, and a pleated sash at the waist. It was time to look into fabric options and to fine tune some of the details for how best to achieve our look. Here is where it’s really helpful when a client is up front with me about her budget. The basic design we’d chosen could be executed in a number of ways, and knowing where Hillary needed to be meant I was able to advise her on the best fabric options for her, and the best places to devote extra labor. In addition to the design, and the budget, we knew that Hillary wanted her gown to have a springtime feel, and to be comfortable. Because her wedding would be outdoors in the afternoon in March, we had to be prepared for a wide range of temperatures (here in Florida, at that time of year, you could expect weather as cool as the 60’s or possibly as hot as the 90’s). Given the broad range of possible temperatures, I told Hillary I thought natural fibers would be a good choice. Most synthetics do not breathe, and should her wedding day be on the warmer end, she would not want to be stuck sweating in polyester. Most silk fabrics were a bit above the budget, and I suggested it made more sense to look for a really good quality cotton fabric than to settle for a lower quality silk. Hillary agreed. We looked at a number of swatches, and ultimately chose a gorgeous medium weight, good quality cotton sateen with just a hint of stretch to it. It was a clean white in a tone that flattered Hillary’s complexion (no yellow undertones). The slight stretch would make it comfortable to wear and move in all day long. The weight was just right to hold the shape of the pleats. It was also a weight we expected would not leave her too cold or too hot on her wedding day. The sateen weave made for just a hint of sheen, enough to have that bridal glow, not enough to look shiny or over the top. The price point was ideal, and left us a little extra to spend on the lace! I let Hillary know that my top recommendation was to look for a good quality but relatively affordable Alencon lace for her jacket. I was certain this was the type of lace used in her jacket inspiration photo, as well as in Grace Kelly’s dress, and would best recreate the looks she had been so fond of. But, to be sure we were considering the options available, we also looked into some Venice lace fabrics as well. Whatever we were to choose, I thought a relatively structured lace would be important for the jacket to have the right shape and fit, nothing too loose or flowing. I discarded several Alencon options simply because there was too much space between the motifs, too much un-embroidered net that would be a better choice for a flowing skirt than a structured jacket. Most of the lace options had floral motifs, and we thought this was ideal for the springtime theme of her wedding. We found a lace we loved online, that was reasonably priced and a really lovely design, and that appeared, from the photos at least, to be a good quality. 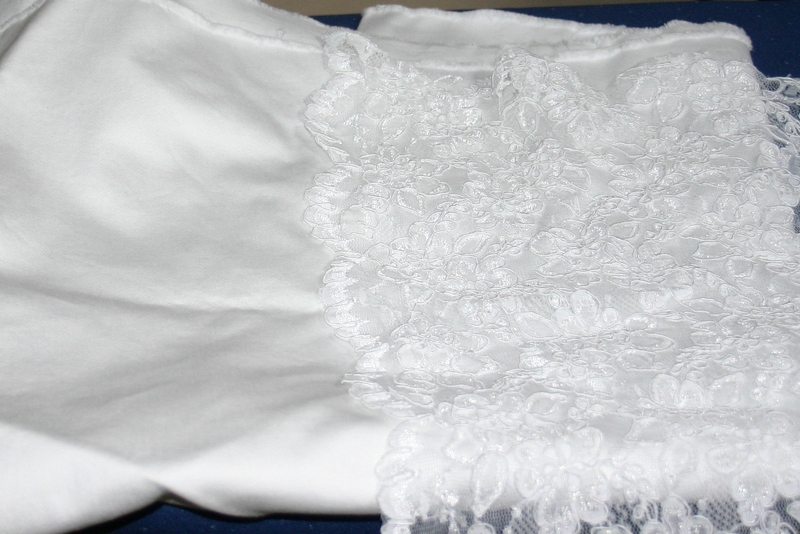 The company did not offer swatches for the lace (which is not altogether uncommon for lace fabrics). They also did not offer returns. It was going to be a gamble. We discussed the options. I gave her my input, and my various reasons for believing it was probably our best option. The choice was ultimately hers, and she decided to take the chance. I was on pins and needles that week, awaiting its arrival, and hoping the lace we purchased would work as we wanted. When the lace came, it was even more perfect than we’d imagined. The drape and hand were just what we needed for her jacket. The color was perfect – a bright clean white, with just the faintest blue undertone that would flatter her skin. It was not identical to, but very much complimented, the shade of white of the sateen for her dress. The floral design practically shouted “spring.” Among the floral motifs, there was a silvery thread that had a slight sheen, just enough to remind me of a light frost early on a spring morning in some place where all four seasons come, but it was not too shiny (something Hillary wanted to avoid). Since the lace was sheer in places, we wanted to line it with another fabric to provide the degree of coverage Hillary wanted. Since the jacket would have full length sleeves, and since the weather might be quite hot, I recommended we choose something very lightweight, breathable, and soft to the touch. We chose an organic cotton batiste that was really just feather light; it provided the coverage we needed and put something smoother and softer against her skin, without making the jacket much warmer. And, for the dress lining, we chose a simple white cotton woven fabric at a lower price point and a slightly heavier weave than the batiste. We discussed a variety of options for the construction of her gown. To have the biggest impact possible without overstepping her budget, I recommended we keep the basic dress pattern simple. The sleeveless bodice had only 2 pattern pieces with darts in each. The skirt was hemmed with a folded topstitched hem, rather than blind hemming the very long length of it by hand. The dress closed with a back zipper, and we opted against a slightly more time consuming (and frequently less durable) invisible zipper, but we arranged the skirt pleats to cover what little of the zipper was not already hidden by the jacket and sash. Early on, we briefly talked about using fabric covered buttons for the sash and jacket sleeves. But when we made our fabric selection, which was a relatively understated cotton, I suggested we choose pearl buttons instead and save those labor hours for the jacket. The jacket would be the “wow” factor. It was the piece that took a simple cotton dress and made it a bridal gown. It was the piece that conveyed vintage style romance, modesty, grace, femininity, and that spoke of springtime. It was the piece that had enabled us both to envision her gown in the first place. I wanted it to be perfect. The fit through the bodice, the length of the sleeves, the precise location where the scallops of the neckline crossed, all needed to be perfect. Furthermore, I wanted to lap the lace at the seamlines, so that the beautiful floral design was uninterrupted – a time consuming process that yields an exquisite result. We talked over the options and Hillary agreed; we would save labor with a simple pattern and efficient construction techniques on the dress, so we could devote additional labor hours instead to meticulously hand sewing the jacket. We were ready to begin! Up next: the muslin.